Known for its unparalleled quality and performance, Moultrie M-40I Game Camera is another hunting camera with sales spiking up the charts. With its advanced features and excellent compatibility with another gadget, this product had been gaining popularity and trust from many hunting camera users and enthusiasts. 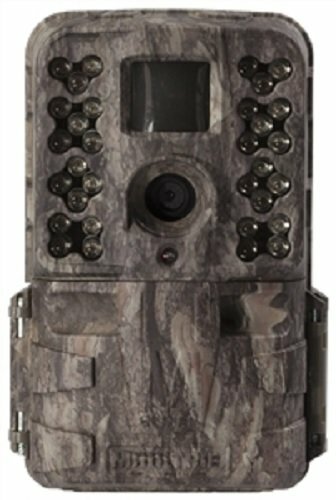 Moultrie M-40I Game Camera Management Series, on the outside has a Moultrie Pine Camo case pattern, which helps it blend well with the trees. Another newly-added and well-loved characteristic in the 2017 Moultrie M-40I Game Camera is its compatibility with Moultrie Mobile Technology. With this feature, you can access any of your scouting materials from almost anywhere, enabling you with optimal scouting flexibility without worrying about your distance from the camera itself. As for the other qualities of this camera, you may take crystal clear photos with the resolution of 16 MP and record videos with the quality of 1080p that comes with sounds. The resolution of this camera does not change, regardless whether you are taking an image or a video at daytime or at night time, permitting you to get quality pictures whenever and wherever. You can capture events at their precise moments with this camera, thanks to its trigger speed of 0.3 seconds. The Moultrie M-40I Game Camera (2017) Management Series has night adjustment features which include 32 LED invisible infrared flash technology that can detect and capture motions of up to 80 feet away– regardless whether it is daytime or nighttime. The Moultrie M-40I also features three capture modes, which many may find useful– photo, time-lapse and video. Consuming only little energy and power, this battery only requires eight pieces of AA batteries– while it can hold a memory card (SD or SDHC) with 32GB capacity. It can also help you with the details of your captured photo or video as you have the option to stamp time, date, and temperature on your output to help you in your observations and in formulating conclusions and findings. On top of that, upon purchasing the Moultrie M-40I Game Camera (2017), the buyer is entitled to a two-year warranty, allowing him or her to make the most of the outdoor camera with the assurance that only the best quality is what is served. Cameras having the same resolution for its daylight and night mode are very rare– making this product an outstanding one in the market. Many will find this feature useful as it gives them the same quality of photos in different time frames and will alleviate the difficulty of having considerations in what the photo implies with a lower megapixel. Its appearance which resembles a tree trunk will enable better camouflage with the trees of the outdoors and the Wild, as it will not be noticed and will therefore not be harmed by animals. Since it is unnoticeable if not closely examined because of the camouflage feature, you can watch the most natural and undisturbed state of the environment you are examining. The compatibility with Moultrie Mobile Technology characterized by this product is very beneficial for those who want to maximize their view of the environment without having to set up too many equipment and cameras and without moving around much. The night light features, characterized by the invisible infrared sensor technology, are dark enough not to be noticed in the night yet not too dim to illuminate the surroundings for a clear photo. The compatibility of this product might also open up for a disadvantage. For example, if one of the Moultrie Mobile had its reception interrupted, the possibility of affecting the quality of your photo might be on the line. The three capture modes of the Moultrie M-40I might seem to limit users who want to obtain much visual evidence through the camera. Though these may be helpful for an entry-level outdoor photographer, it might not be that much of help for those who are in need of more outcomes. In addition to the given disadvantage of the same feature, it may also be a con because there will be a lot of pressing involved, which may result in the failure of capturing a particular moment. Unlike other cameras which offer the opportunity to capture videos simultaneously with recording a video, this does not provide such. You will have to take a photo first, then a video or vice versa. The dilemma here is having to capture something in two different mediums and outputs at the same time. Overall, users can expect the best quality of images and videos with the help of this camera. It has a consistent resolution of two differently light-demanding time frames. Also, it covers a good, long distance of detection and recording and gives a wider, more practical view of the outdoors. The disadvantages of the Moultrie M-40I camera are manageable, considering if you’re on a tight budget or simply on the entry-level in the field of using hunting cameras or even outdoor surveillance itself. On top of that, there are more overpowering perks of the advantages rather than the disadvantages.